This recipe isn’t so much a “recipe” as it is “another reason to love your slow cooker”. It’s so hands-off, it puts everything else on this website to shame. Actually, scratch that. There’s a time to turn on your oven and dirty a lot of dishes and make a huge mess in the name of a seriously good slice of double chocolate zucchini bread*, or banana bread*, or a s’more* (none of these recipes actually make that much of a mess, by the way), but I’m not sure that time is a 90-degree day in August, that’s for sure. Actually, I’m positive that a 90-degree day in August is not the time because no amount of window opening or ventilation fan-ing will prevent the kitchen from heating up to approximately thedepthsofhell degrees fahrenheit. And you deeeeeeefinitely don’t want to turn on your oven for multiple hours, which the traditional method of caramelized onions calls for. Not unless you also hope to be able to fry an egg on your countertop, that is. 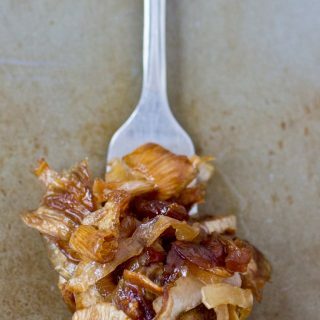 It almost seems cruel that caramelized onions, which typically require an unholy amount of time in the oven, are also the perfect summer food, and nothing rounds out a burger (or a sandwich or a salad or an empty fork) quite like them. They’re soft or crispy – depending on your preference, no judgement – and slightly oily and sweet with not a hint of the bitter funk that raw onions leave behind in your mouth. I love caramelized onions not only because they taste fantastic, but because they immediately class up even the most pedestrian of picnic food. Supermarket burgers straight off the grill? Add caramelized onions and all of a sudden they feel gourmet. Boring salad getting you down? Throw on some caramelized onions and now it feels like a fancy $19 salad from a brasserie downtown (or wherever you get your fancy overpriced salads). I hate caramelized onions, on the other hand, because they require so much cooking time. I mean, honestly, the cooking time + the outside heat = deal breaker. I also hate caramelized onions because sometimes, if you don’t cook them just enough at exactly the right temperature, instead of slowly meandering from bitter sharpness into the sweet, succulent depths of caramelization, they just burn. And then you have burnt bitterness and a lot of wasted onions. That, and about five million other reasons, is why I love my slow cooker. 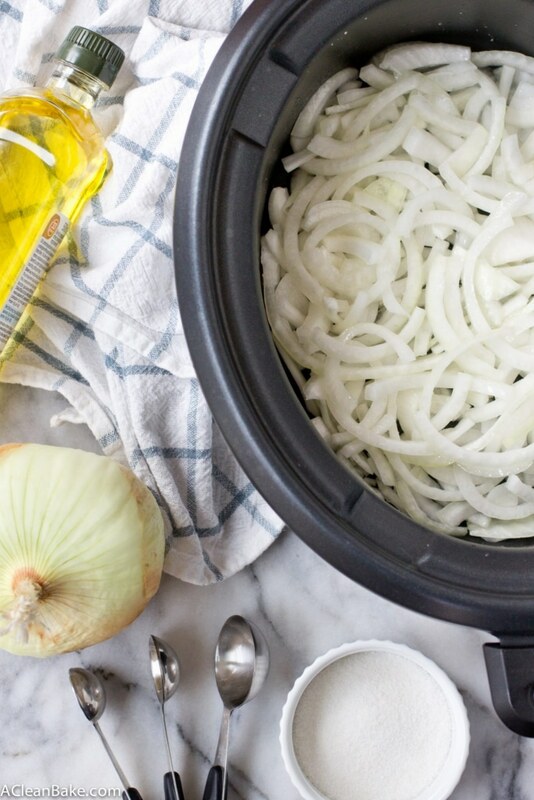 I know slow cookers (aka crockpots) are kind of the epitome of Pinteresting trendiness, but they are so incredibly handy – and not just in the winter. If anything I use my slow cooker more in the summer since it doesn’t heat up the kitchen the way the stove does. And, since it cooks the onions low and slow, you basically have to try to burn them – and even then I’m not sure you’ll succeed. If you like your onions on the crispier side, you’ll see. You’ll cook and cook and cook them and when you’re sure they must be burned beyond recognition, you’ll find them perfectly crisp and just ready to be eaten with your fingers like a chip. Don’t fight that urge. 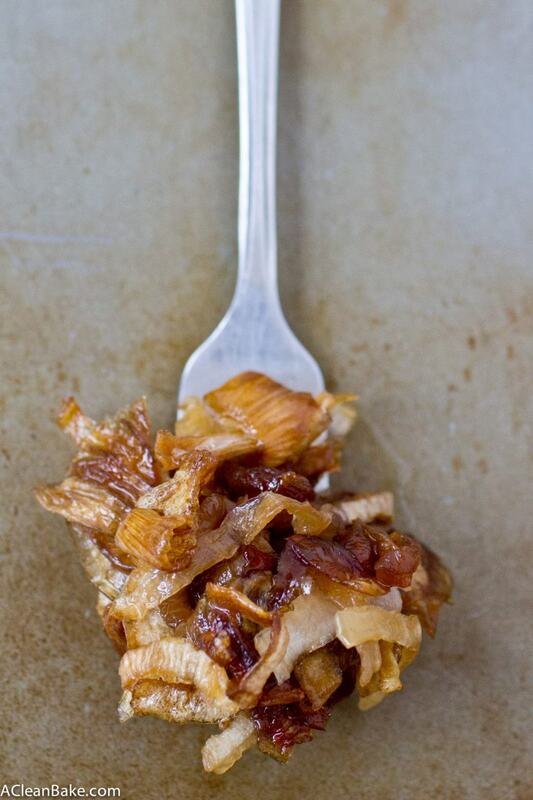 If, on the other hand, you prefer your caramelized onions soft and succulent, the slow cooker can do that too. Just skip the step where you remove the top and let the onions cook down in their juices until they are deep golden brown and, well, floppy enough to be eaten right off the fork. Don’t fight that urge either. Stop back on Thursday for a really great non-burger-related way to use these that is perfect for your next picnic! PS: Who knew I could write so many words about onions? *But if you happen to live in a place that is not currently blazingly hot, I highly recommend all three of those recipes on behalf of satisfied neighbors, friends, readers, and party guests who had a chance to make and/or taste them over the weekend. I never get tired of hearing your reviews of my recipes, good or bad (but hopefully good! 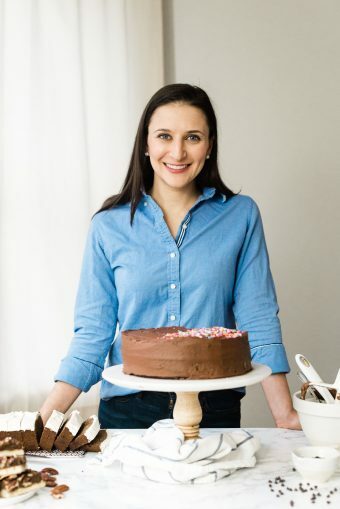 ), so if you make these, or any of the recipes from this site, please send me a picture (acleanbake@gmail.com) or post them on social media with the hashtag #acleanbake, so I can see! Peel your onions and then cut them in half, then into roughly 1/4" slices. In the bowl of your slow cooker, toss together the onions and oil to coat, then add the salt and toss again to combine. Cook 8 hours on the low setting with the cover on, then remove the cover and continue to cook an additional 1-2 hours. Once the onions reach a deep amber color, they are done. This is the slow cooker I used for this recipe. It has a 4-quart capacity. If your device is significantly smaller, you might want to make a half batch of this recipe, or cook it in two batches. If you want our onions to be crispy, remove the cover after 5-6 hours. If you prefer a set it and forget it method, you can leave the lid on for the full 10 hours, but your onions may not caramelize as deeply. You'll also have a bunch of cooking liquid (onion broth?) that you can simply discard. I’m constantly amazed at what can be made in a slow cooker and had no idea you could caramelize onions in one! I, too, adore putting caramelized onions on just about anything and don’t have the patience to hover over the stove to make them in the frequency that I want them. I’m loving this set it and forget it method! Right!? Me too! Doesn’t this open up a whole new world of non-soup or -stew ideas?? Love this! 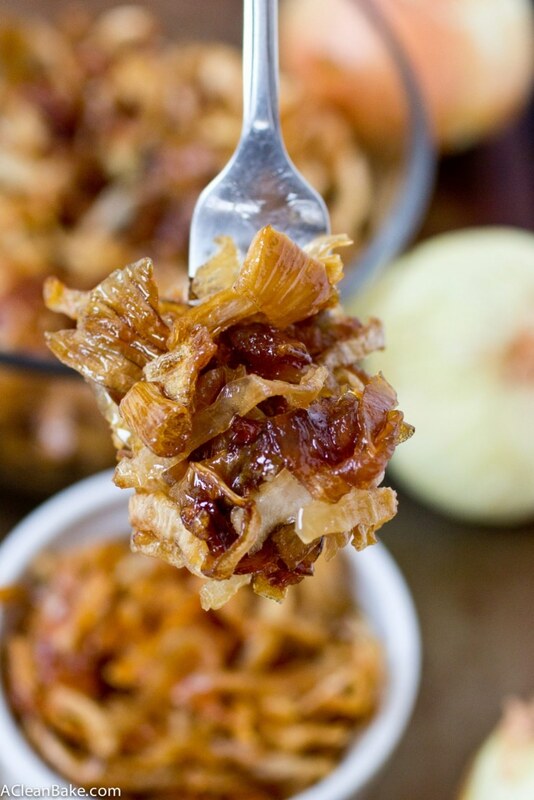 I am totally making my caramelized onions this way next time! Awesome! I hope it is a big time saver for you! +1 on the slow cooker love! I love mine! 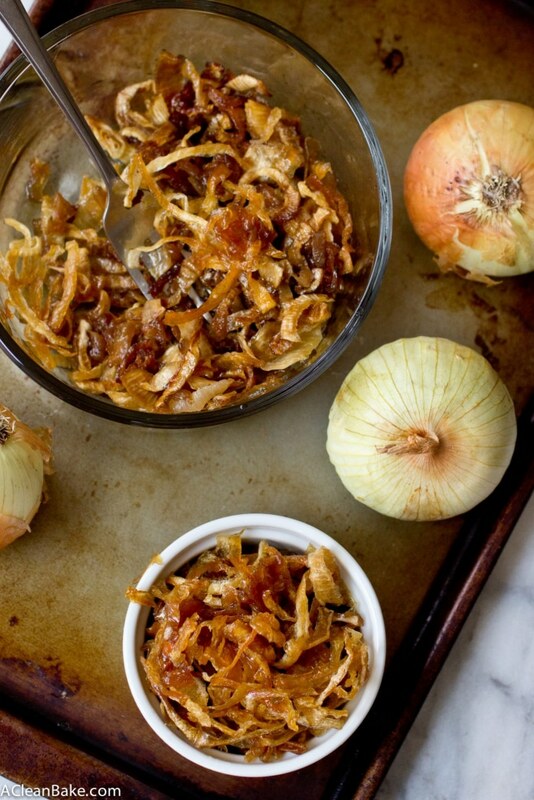 Sadly I haven’t had it out in awhile and that needs to change…when I make my caramelized onions next time I’m definitely trying them out this way! Oh man, bust that thing out! It is SO great in the summer!! Yummm! I always love caramelized onions but have little patience to make them. Slow cooking I think is best! 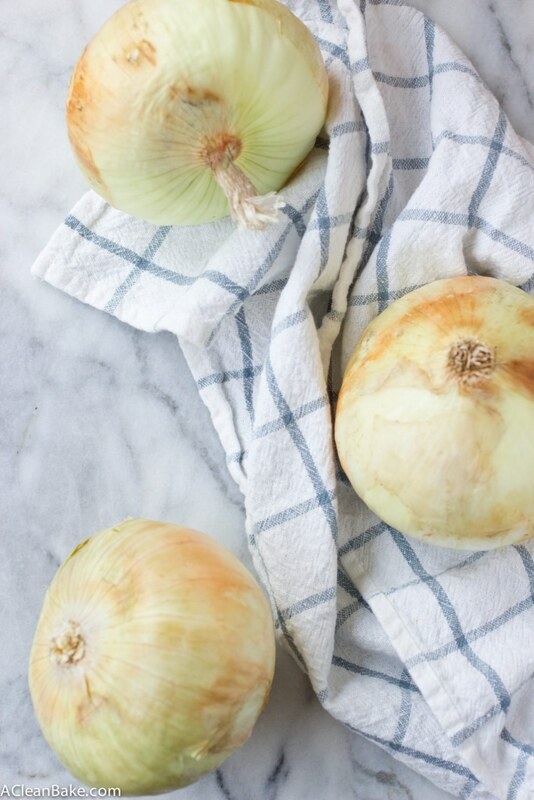 So I just got a big bag of Walla Walla Sweet Onions from a friend who lives in Eastern Washington and I’m thinking all things onion right now, so this is perfect timing! Who knew?! I’m wondering if I can freeze them after I cook em’ up in the slow cooker…. hummm. Perfection on burgers? Yes please… and oh so much more! Thank you for this Nora! Hey, talk about perfect timing!! Also you read my mind on the freezing thing: I was wondering the same thing. From my experience with similar foods, you probably can freeze them and they’ll be just fine, but I have never tried it. If you do, let me know! Hi Chrissa! Thanks for including this recipe! I look forward to checking out the article.